With the new design for the epi-pens and a case of 3rd grade bullies, I couldn't find an epi-pen case that would easily hide under clothing and fit two of the new epi-pens along with two doses of easy measure Benadryl. So, out of necessity, I started sewing! 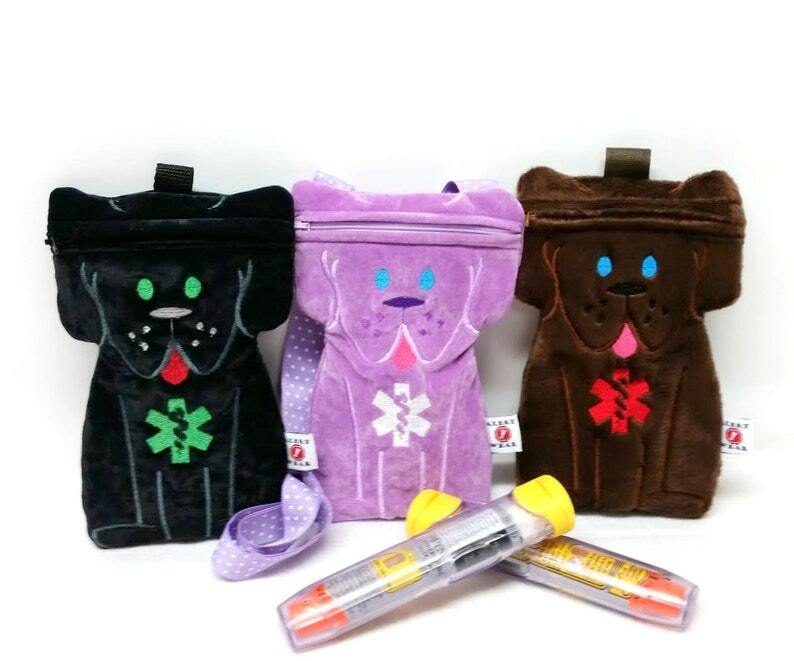 My kids love that they were able to create their own designs for their cases and I have had fun helping other kids create their own custom epi-pen cases. I have had so many requests for a case similar to the owl but, more geared towards boys. I initially started making Alert cross body bags for my daughter to wear with dresses. She loves the fanny pack cases but, they just don't go great with dresses and skirts. This design is custom made. You can choose the fabrics and colors and what type of strap you'd like. I can leave the strap off all together and add a loop for a carabiner clip to clip on to a belt loop or back pack as well. The top zippers shut. The inside is fully lined as well with a layer of Polyester Thermolam Quilting in between. With a strap, they are to be worn across the chest. Once you have completed your order, you will receive an email confirmation. At the bottom of the email is a link for the design forms. Please complete the design form. Or if you would prefer, include the eye and medical alert sign colors in the comment section along with the length for the strap. Design was purchased from www.embroiderygarden.com. We love the purse. It is for my 11 year old daughter and it is perfect for her age. I got it to help her to be responsible for her meds.